The Consolidated Model 17 Fleetster was a 1920s American light transport monoplane aircraft built by the Consolidated Aircraft Corporation. Designed to meet a requirement of the New York, Rio, and Buenos Aires Line (NYRBA) for an aircraft to serve the coastal routes in South America. Consolidated designed the Model 17 Fleetster. The Fleestster had a streamlined all-metal monocoque fuselage with a wooden wing. The powerplant was a 575 hp (429 kW) Pratt & Whitney R-1860 Hornet B radial engine. It was available as a landplane or seaplane and could accommodate up to eight passengers, although the three NYRBA aircraft were fitted with two full-width seats each for three passengers. A parasol-wing version (the Model 20 Fleetster) was also developed with the wing supported by four short struts. The open cockpit was moved to behind the passenger cabin and the space used as a cargo compartment. Three aircraft were built for NYRBA and a private Canadian customer. 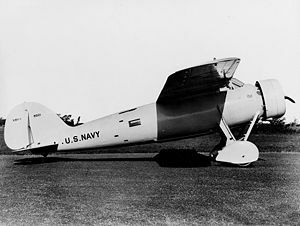 In 1932 a carrier-borne dive bomber version (Model 18) was evaluated by the United States Navy as the XBY-1, it was not ordered but was the first stressed-skin aircraft, and the first aircraft with integral fuel tanks in the wings operated by the Navy. Nine-passenger version powered by a 575hp (429kW) Wright R-1820E Cyclone radial engine, three built for Luddington Airline. The wing had an increased span and area to give an increased maximum take-off weight. One aircraft powered by a 575hp (429kW) Wright R-1820E Cyclone radial engine. Two-seat carrier based bomber for US Navy with revised wing (50 ft (15.24 m) span) featuring a integral fuel tank. Fitted with an internal bomn-bay capable of carrying a 1,000 lb (450 kg) bomb and powered by 600 lb (448 kW) R-1820-78 engine. One built, evaluated as XBY-1 (BuNo 8921). Parasol-wing version of the Model 17 for the NYRBA, 4 built. Production version for the Transcontinental and Western Air was a quick-change variant for passenger or cargo work, seven built. One Model 17 bought for use of the United States Assistant Secretary of War, later modified to Model 17-2 standards and re-designated C-11A. Refined version of the Model 17 for the United States Army Air Corps, three built.